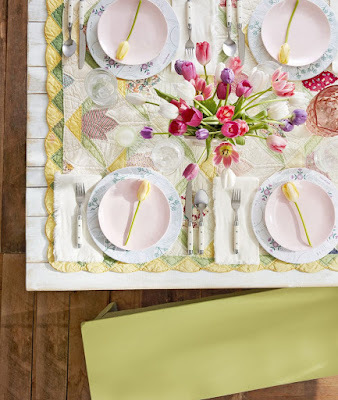 All you need for these pretty Easter baskets is cord, fabric strips, and glue. 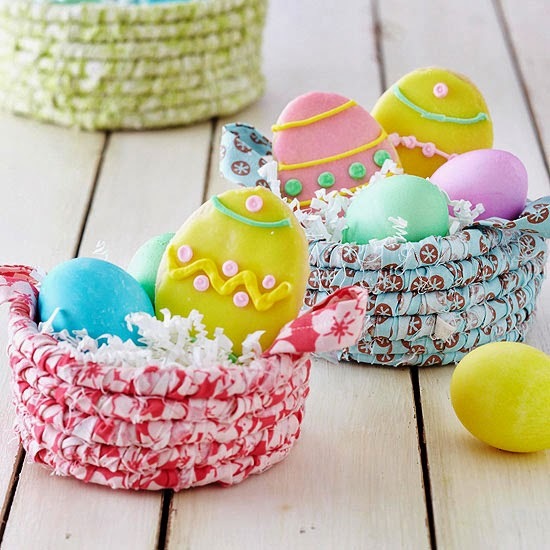 Fill them with spring treats for a sweet Easter present. To make one basket, you'll need about 3/4 yards of colored print fabric (cut into 16x1-1/2-inch wide strips), 4 yards of cotton piping cord, and a hot-glue gun and glue sticks or needle and thread. Hot-glue the first fabric strip to one end of the cord, and wrap it around the cord at an angle. Do this until the cord is covered entirely. Coil the cord tightly around itself, hot-gluing or sewing as you go, until you have 2-inch spiral. Contine the spiral until the you've reached your desired base size. Stack the next round atop the base, gluing or sewing as you go, until your basket is the desired height. Add tiny handles fashioned from leftover fabric strips. 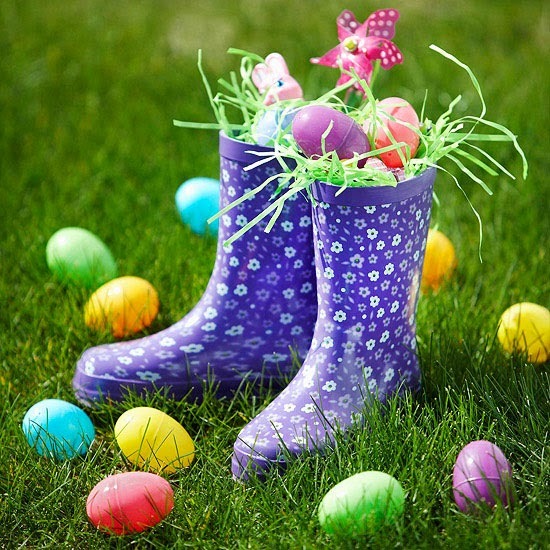 Spring-pattern rainboots serve as a neat hiding place for sweet Easter treats. Start with a layer of Easter grass tucked in the bottom of each boot. 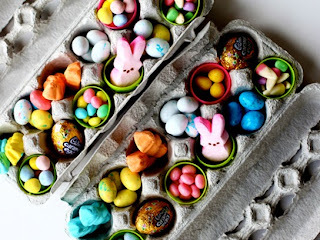 Add plastic eggs, candy, and other small items until you've reached the top, then tuck in more faux grass for a pretty Easter display. 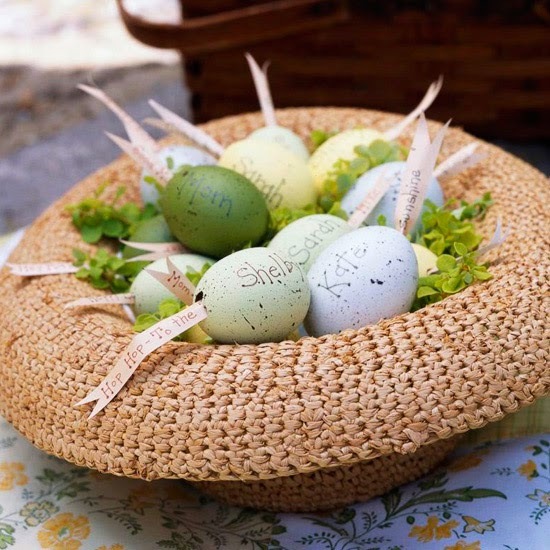 Improvise a pretty Easter basket using a simple straw hat. 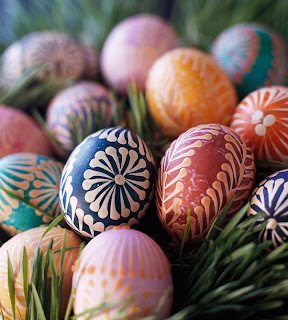 Fill it with softly colored eggs, either real or artificial. Hollowed-out eggs can be stuffed with paper ribbons that include spring wishes, egg-hunting clues, or even names for place cards. This adorable Easter basket comes together with a bit of scrapbook paper and ribbon. 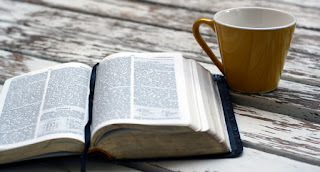 First, download our pattern (available here); cut out. Fold the pieces on the dotted lines as indicated, and punch out each circle on the sides. Adhere each side to the back and front pieces, and fold up. Thread ribbon through each hole to hold the basket together, then attach the handle pieces. 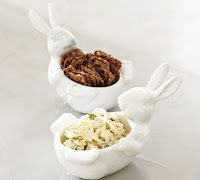 Fill with plastic eggs for a fun and simple Easter basket. Refresh a basic wooden Easter basket with a bag full of colorful buttons. 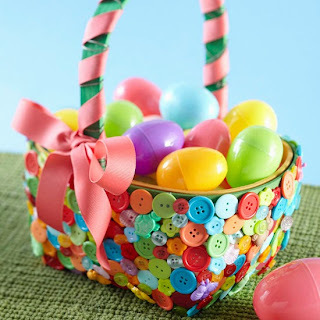 No need to be exact -- hot-glue buttons in all shapes, sizes, and colors onto your basket for a truly unique look. Tie a pretty pink ribbon to the handle for holiday-ready presentation. 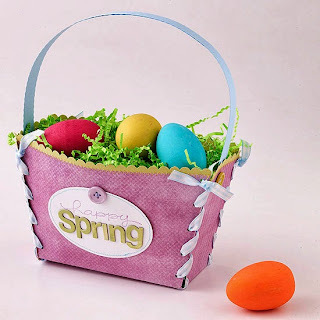 Embellish a reusable basket with foam flowers (available at crafts stores) and lengths of pastel ribbon to look like a blooming display. 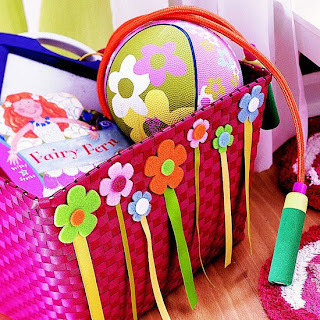 This Easter basket is perfect for gifting books or sports equipment because it's sturdy and large.